We don’t often review bars here at The Infatuation, especially ones on the far west side of the city. As a matter of fact, before making my way across town to check out Porchlight, I was 99% sure that 11th Avenue was an NYC urban legend, like buildings that don’t have a 13th floor, or sewer gators. 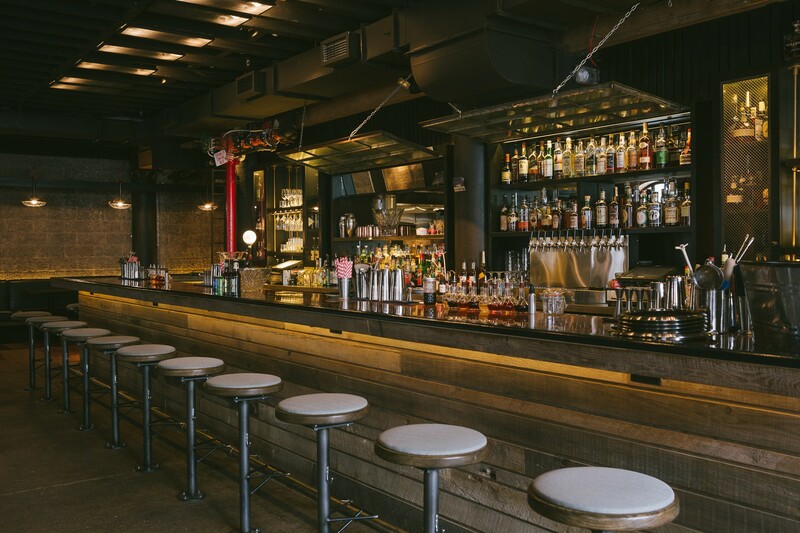 So if we don’t cover cocktails and we hardly ever come to this part of NYC, why are we reviewing Porchlight? Because Porchlight isn’t just a bar. Porchlight is a drinking establishment brought to you by the king of hospitality and hamburgers, Danny Meyer. And as we suspected, it’s better than your average mixology spot, thanks not only to the cocktails, but also the details. The drinks are well-crafted, the service is top notch, and we’re big fans of the space that Porchlight occupies, which is ideally situated for both a two-person meet up and a ten-person get-together, thanks to a game room in the back. Being that the point of our platform is food, and that we’re not sure what to say about drinks beyond taking every opportunity we can to use the word “swizzle,” let’s talk about what Porchlight offers to eat. The menu is a collection of what we’ll call Cajun bar bites, consisting of small plates like boudin balls, frog legs, and fried oysters. And while none of it will particularly blow your mind, all of it will serve as an excellent accompaniment to a stiff drink and a discussion with a friend about how much you hate your boss, or whether or not alligators really do live under the street. You eat it for breakfast, why not eat it while you drink? Order the avocado crab toast. The idea here is Cajun spring rolls - basically a Louisiana meat pie rolled up into a crispy shell. You want some. We’re not sure who Tom is or why he gets to have his balls on this menu, but we’re assuming you have to do something pretty awesome to achieve such a thing. So congrats on that, Tom. Get drunk, eat cookies. That’s my motto. What’s yours? Lantern’s Keep is a cocktail bar in Midtown West that’s useful to know about if you’re trying to impress someone.